“We’re really in the spotlight here,” says Laurent Jarlégant. Below him lies the huge Pont-Rouge site, where Implenia’s foundation engineering specialists are completing the final excavation work. 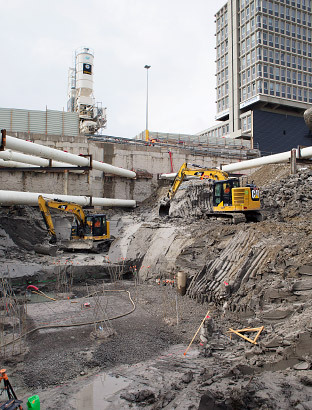 The walls of the pit are shored up with great steel rods, and at the deepest point a crawler excavator digs into Geneva’s clay-rich subsoil. But there’s no artificial lights required here in Lancy. The spotlight referred to by Jarlégant Gant, Project Manager at the B1 Plot, is entirely figurative. Pont-Rouge, as a pilot project, is being closely watched for at least three reasons. The first is that the resulting building will be the first in Western Switzerland to meet the DGNB sustainability standard. 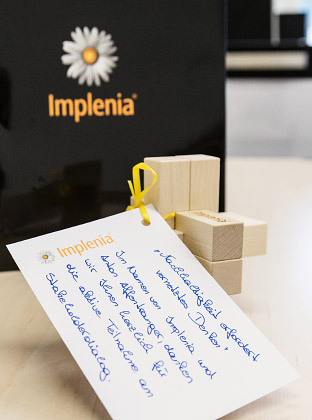 Secondly, Implenia is testing out a ground-breaking logistics concept on the site. And thirdly the Pont-Rouge project is a testbed for the company’s new environmental protection concept. “Pont-Rouge” is the urban centre growing up around a new railway station in the Geneva neighbourhood of Lancy. It is one of the biggest construction projects in the region and will ultimately include five mixed-use buildings. There will be offices and business premises, as well as restaurants, cafes, shops, leisure facilities, public amenities and a hotel. SBB Immobilien AG has hired Implenia as total contractor to build the first stage of the development on Plot B1. Construction work began on 1 September 2015 and completion is planned for autumn 2018. One specific challenge for the project is the need to achieve DGNB sustainability certification. Pont Rouge has been pre-certified in the “Gold” category. At this early stage of construction, however, you have to look a little closer for evidence of these great ambitions. Look, for example, at the dumper truck taking spoil away from the excavator: it’s barely driving more than two hundred metres with each load, because right next to the excavations there is a large track system where a wheel loader is transferring the spoil onto freight wagons. 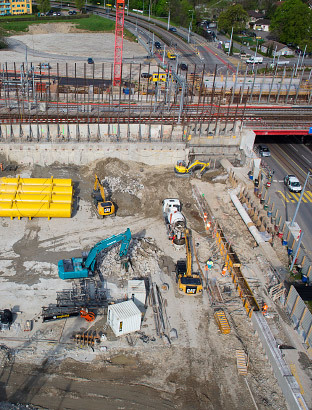 “This environmentally friendly system for removing excavated material is saving the city about 20,000 lorry journeys and massively reducing the project’s CO2 footprint,” explains Benoît Klein, who is responsible for Implenia’s sustainability efforts in French-speaking Switzerland. On the edge of the construction site there are two water purification plants and just outside there are several skips for separated waste. These disposal facilities are part of the new environmental protection concept that Implenia is testing at Pont-Rouge. “These things aren’t particularly revolutionary,” Klein concedes, “but we want to be exemplary in everything we do here”. If the concept proves successful, all Implenia construction sites will adopt the same practices in future. The DGNB certification system was launched in 2008 by the German Sustainable Building Council (Deutsche Gesellschaft für Nachhaltiges Bauen). It is a demanding sustainability standard, with 41 criteria grouped into 6 categories. The evaluation is based on ecological, economic and socio-cultural factors and also takes into account the quality of the processes, the site and the whole life cycle of the building, including its operation and eventual retirement. A special feature of DGNB certification is that checks are made subsequently to ensure that the planned values – e.g. for energy consumption or indoor temperature and air quality – are actually being reached in practice. Depending on how well the requirements are being fulfilled, the building is given a bronze, silver, gold or platinum award. More than 1,000 awards have been granted around the world under the system. The way Implenia is centralising logistics on site is, however, something of a small revolution. Usually all the construction firms involved in a project bring all the building materials they need to the site themselves. “Particularly during the final fit-out, building sites tend to end up looking like a bazaar”, says Laurent Jarlégant. 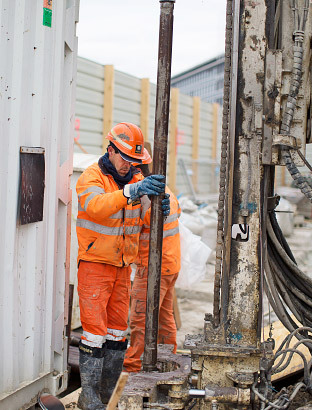 “We’ve put a dedicated team together here in Geneva just to take care of the transportation, storage and disposal of materials.” Suppliers bring the material to the site entrance, and the team ensures it’s taken to the right place (see illustration). By centralising the logistics, Implenia can check all the goods that arrive. This is vital to DGNB certification, which requires the company to ensure that only the planned and permitted material is used on the project. Solvent-based products and biocides, for example, are banned. 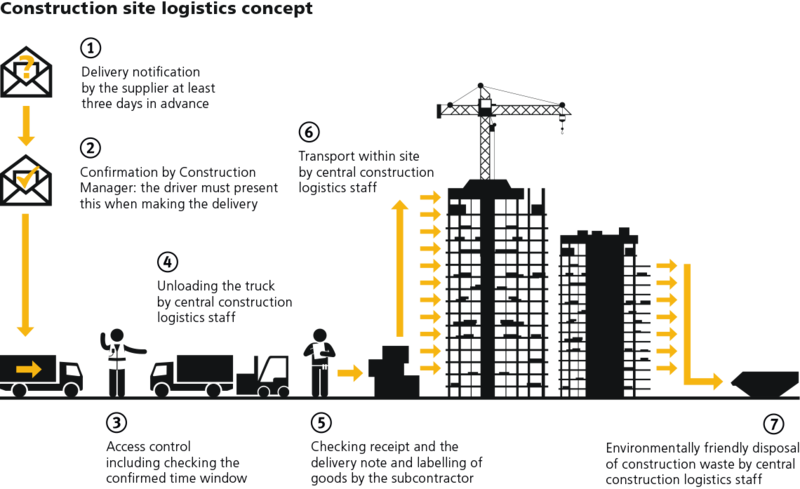 The DGNB standard thus also affects the way the construction site is organised. Another aspect of this is the detailed documentation of all the materials used. Despite all this documentation, the aim is to use as little paper as possible, so another efficiency-boosting innovation at Pont-Rouge is the use of a digital platform for all documents. “Thanks to all the new approaches we’re testing here in Geneva, the building work is going to be highly effective,” says a confident Benoît Klein. The building site fits perfectly with Implenia’s “One Company” philosophy and Lean Production approach. “We will be able to use the know-how we acquire at Pont-Rouge on other projects and take the whole construction industry forward as a result,” Klein predicts. The Pont-Rouge project in Geneva is also a prime example of how to apply the “One Company” approach in practice. Implenia formed a dedicated Pont-Rouge project team with representatives of the different operating units and support from environmental specialists, lawyers and lean management experts. All the know-how needed to execute a challenging project effectively is thus present on one central body.